Would you consider performing surgery on yourself? What about tackling that home renovation by yourself? If you heard that millions of people do these tasks on their own, you might be confused as to why they would do that. There is risk involved. Every year, millions of people make the decision to prepare their own taxes. While, this decision does not put their life at risk, it does put them at risk for legal issues, increasing costs, and wasting valuable time. For many taxpayers, online programs are a good way to prepare your taxes. Many of these taxpayers have simple returns with one source of income from an employer. They might have mortgage interest, student loan interest, or childcare credits. For those with more complex returns involving multiple sources of income, revenue from businesses, interest and dividend income, capital gains, etc., seeking the help of a tax advisor is the most efficient way to file your income taxes in a way that saves time, money, and stress. Even simple returns can be complex. Examples are: if a taxpayer lives in one state and receives income from another, capital gains, 1099 income, or income derived from a business. Many online programs are designed with the masses in mind. The problem is that each individual is unique and sometimes we see items reported in the wrong spot or missed because of this. Additionally, tax laws change every year. A tax advisor is going to know what affects you or your business and what does not. Many people try to prepare their own income tax returns in an effort to save money. However, many of those people end up spending an inordinate amount of time preparing their taxes. If your time is better spent with family or generating income, you may want to hire a tax advisor to save the time. Tax advisors can save you money. In addition to time, a tax advisor can save you money. They will know what questions to ask and what deductions or tax planning strategies can save you money. In addition, mistakes on an income tax return will cost you. Sometimes, people who file their own taxes, can miss deductions that they should have taken. Conversely, sometimes people report deductions that they should not be taking, make mistakes reporting capital gains, or omit information by mistake. These mistakes can cost you real money. A tax advisor can help you plan ahead. Many times clients have an idea of what is coming. Maybe they are selling a house, buying equipment, having a child, or have a big sale coming. A tax advisor will meet with you and plan for the tax implications ahead. 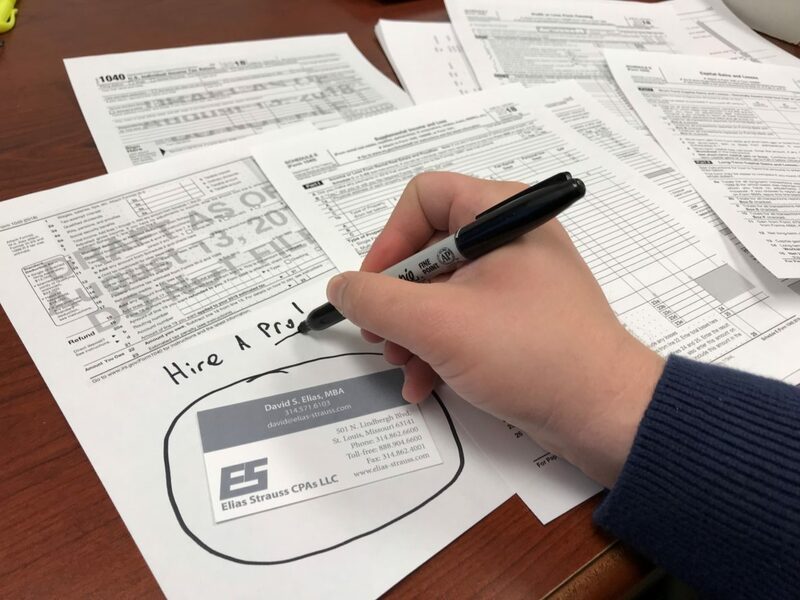 The best way to avoid stress when it comes to taxes, is to hire a professional and know that you have filed your returns on time and correctly. A good tax professional will collect the information needed for the return and have it on file, in the event you need it for any reason. If you have been filing on your own or have any tax related questions, please feel free to comment or send us an email.